Manage your health care conference team with a swipe. On the fly and in a flash. Schedule your team’s booth coverage, attend key sessions, and share what everyone learns. ​All it takes is a tap. 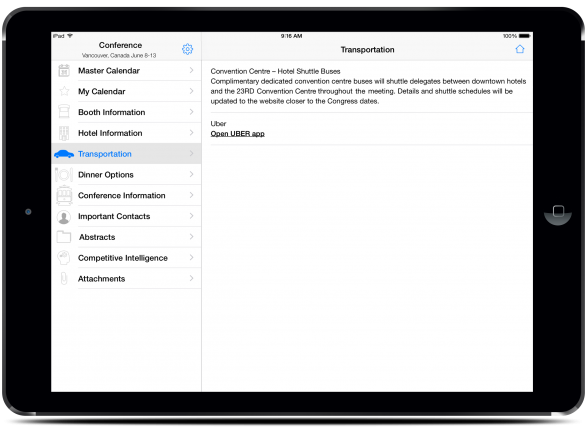 Hotel information, transportation, and conference details are instantly accessible. Get real-time updates and add event details with locations and descriptions. Never miss an appointment Receive reminder alerts and quickly check information for each event. Conference attendees pool their information digitally. Daily. Information becomes insight that’s sent securely to your competitive intelligence team. ​SimpleConferences® is as intuitive as it is impactful. No training required. ​Familiarize everyone with the local amenities. Provide your team with cost-effective transportation. What’s good on the menu? Pick highly rated restaurants integrated with Yelp. Find out easily with addresses linked to Maps. Want more functionality? Integrate 3rd-party apps. Coordinate your team. Consolidate your effort. Optimize your impact. Transform your conference team into a business intelligence center. Share what they learn instantly. Supply team members with conference information customized to their assignment. Ditch the spreadsheets and the binders. Put the playbook in their pockets. 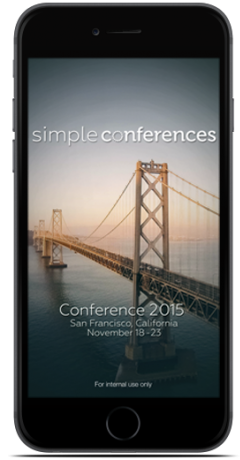 Seamlessly designed for iPhone and iPad, SimpleConferences® requires no training. Just choose your features and go. Optimizing conference teams around the world. 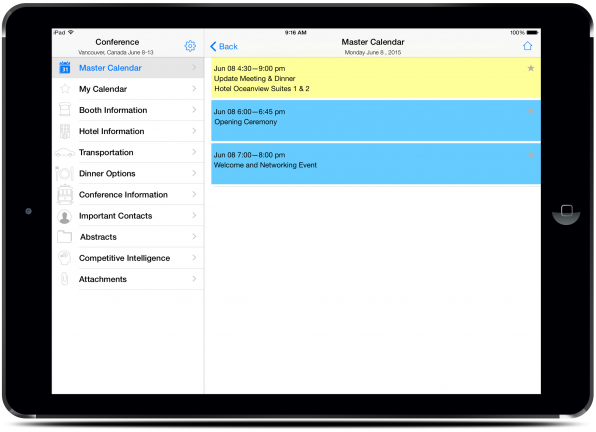 Maximize ROI with the app designed for healthcare conference teams. Get the most from your conference team.